During maternity leave this last time, whenever I started cleaning the house, Deaglan would stop what he was doing and look up in surprise. “Mommy, who’s coming over?” he’d ask as if that’s the only time I ever cleaned. I always explained to him that I was tidying up so we could have a neat place to play in. And when I was done, I’d intentionally ask him to describe how he felt when he looked around, hoping he’d associate good feelings with a clean house. I haven’t seen any dividends from my Pavlov-ian efforts but I still hold hope that someday it will pay off. It’s the one area in which I’ve wished for just a hint of mental illness in myself, a trace of OCD. Before Jon and Kate became known for their divorce and public theatrics, I watched in awe, Kate’s organizational skills. I sat mesmerized while she worked through her day keeping to a tight schedule of never-ending meals, laundry and hair-braiding. I’m not neat by nature. We had some family over for lunch today. I cleaned for several hours in preparation. Yesterday I worked on the main floor and this morning after an extra large coffee I did the bedrooms and bathroom upstairs. You’d have thought I hadn’t cleaned in weeks. It’s the thing about having two small kids, a spick and span house can be turned on its ears within about ten minutes. I’m not just telling you this to convince you that Shaune doesn’t do everything around here. I was exhausted and starving by the time he had this pasta on the table in time for lunch. There were four of us snapping our fingers, making stupid faces and clapping to get these knuckleheads to cooperate for a picture with Gramma and Grampa. Sweat onions and garlic in 2 tablespoons of olive oil on medium heat, gently until translucent. Add sugar and the redwine vinegar. Add tomato paste and cook for three minutes. Add the tomato puree (Shaune's note: do not over-puree the tomatoes; you want it chunky but with no large chunks. Use an immersion blender if you have it, or food processor or regular blender - immersion blenders are cheap and the best way). Turn to low heat until the desired consistency is met. Add salt and pepper to taste. Add basil (optional) or minced hot chili for spicy ragu. 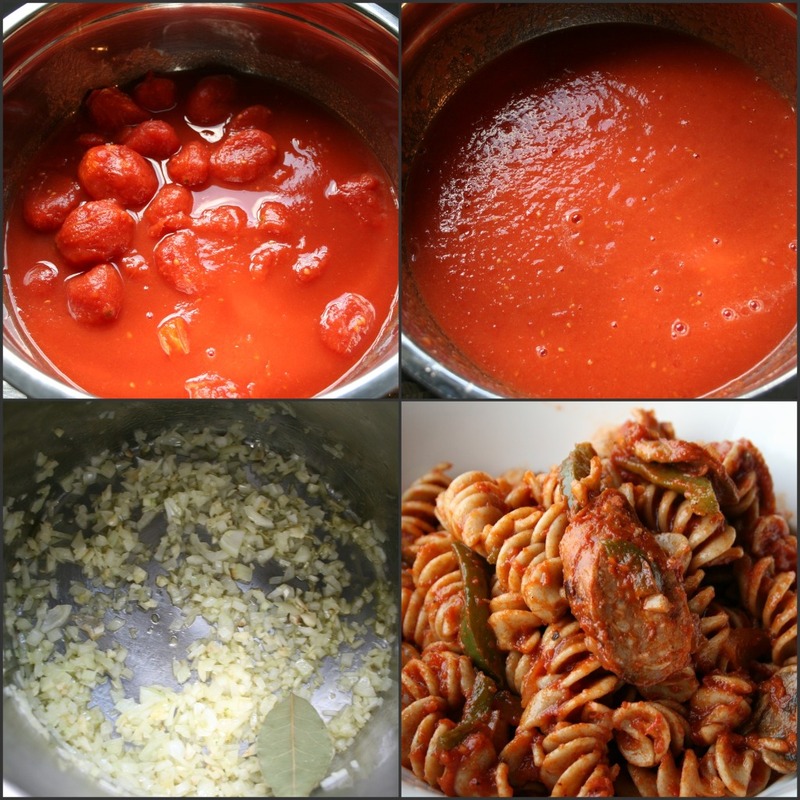 For pizza sauce reduce to thicker consistency and add one teaspoon of ground fennel seed! Grill sausage and let cool, slice thinly on the bias. Sautee peppers and mushrooms in one tablespoon of olive oil. Add grilled sausage and heat through. Add tomato ragu and toss with fusili. Gramma brought a caesar salad and garlic bread, and Aunt Katie an apple crisp. Needless to say we didn't eat dinner tonight. I am laughing out loud to this post. I like a neat house, but it is nearly impossible with kids...no matter how many you have. I hear ya. I don't do windows either. Unless I'm hosting a brunch for new moms of multiples at my house. When I did this, I spent like 12 hours cleaning. And I did do the windows! Is it sad that every time I clean my husband asks "who is coming over". I guess that really is the only time I clean. That pasta looks delicious! I love Deaglan's comment! It's classic! I'm not neat either. (I used to be!) It was a losing battle, and so I just gave up. Now, when we have company, I am so exhausted from tidying up that I don't have energy to enjoy my visitors. And within a day or two, the house looks like a cyclone went through anyway. The saving grace though-there is always good food when we have company. Shaune's recipe looks delicious!! I am going to try it out! Um, can your husband send some food down here? I wish mine cooked more. His version of dinner is "So what do you want me to pick up?" You are so right about how quickly a house can disintegrate into chaos. I admire organized people too! I used to be neat, but that went away after the first kid came along. Now I settle for decent. I am going to ask for that pasta dish for dinner this week. I am obsessed with anything made with tomato sauce right now. My house is a disaster. I've pretty much given up. Sadly, this is due to my grown husband, not two adorable boys. I like taking photos of the adults trying to make the kids look at the camera and more photos of them trying to make them laugh. I know I look hysterical trying to do so. One day, one day, I will have to experience this cooking you get to enjoy all the time. But I do envy you his cooking abilities. My husband can boil an egg and that's about it. I'm like the roadrunner around here before guest come over. Exhausting!!! I'm starving now after looking at that delicious picture. Yum! Cute photos with those lovely smiling grandparents.